Door Kickers is a difficult, rewarding puzzler so obsessed with its tactical ideas that it rejects all elsewhich is probably for the best anyway. Almost immediately after I’m spotted, the bad guys kill the hostage. I take a brief moment to unleash a string of curses and rack my brain. There must be another route I can take, another plan that would give this scenario a happy ending. I tinker with the map and reset, and soon I hear a meaty splat as the hostage gets killed again. Door Kickers is a game about cops kicking down doors, and these doors are a lot of fun to kick down. It is also very hard, and I love it for that. Played from a top-down, pausable view, this is the game that happens when Rainbow Six’s planning stage grows up and finds a home on a modern engine. It is also one of the most finely detailed, cleverly executed puzzle games I’ve played in years. Are there narrow hallways? Will all firefights be up close? Are there hostages? Do I have sharpshooter support? Is there furniture? Is there evidence to save? Do the bad guys have bigger guns than me? Every piece of information changes the ideal approach and forces adaptation. After the deployment screen, the mission begins with time paused. 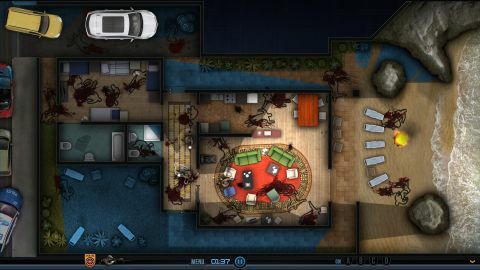 From the paused overview, I drag paths for officers to follow, change the direction they’re covering, and order them to breach a door. This simple array of options becomes a complicated choreography of death pretty fast. In later missions, my eight officers follow a dance routine with hundreds of steps, pauses, shooting angles, and go-codes. Giving these orders is straightforward and malleable, but the interface is missing some important functions. If I give two units overlapping paths (walking single-file next to a wall, for example), I don’t have any way of selecting one trail over another when I want to edit it. To work around this, I have my units walk behind and to the side of each other, but that’s frequently a poor decision, tactics-wise. With eight officers in a narrow hallways, it also gets downright silly. Some of the other limitations of this system are simply built into the game engine: there’s no crouching or leaning, so the game’s combat takes place entirely on a two-dimensional plane with straight lines. It rarely feels as flat as it is, but there are occasions where I would love to stack a crouched unit under a standing unit, and these are the times when the game’s simulation feels most like a puzzle game and least like a camera looking down on a real-life SWAT situation. After learning the basic commands, which the early missions walk through gently, I set about trying to ace each of the 78 standalone missions, running them over and over again to correct my dumb mistakes. This takes hours and hours, and should I suddenly become talented at Door Kickers (unlikely), I’ll have a powerful map editor ready to create more. The Steam community is populating the integrated Workshop with almost 200 new scenarios, many of which are indistinguishable from the professional efforts. This is the game’s greatest strength: failure is instructive, puzzles are infinite, and restarting is effortless. In some ways the process of attacking a new map reminds me of debugging computer code: first go here, then go here, then do this. Compile. Oops. Do it again. I don’t mean to make Door Kickers sound dry. This is a flashy, interesting world full of seedy drug dens and cartel-owned mansions. Blood sprays and broken glass chart my violent progress through every level. And Door Kickers has amazing sound design. The soundtrack is a little too wub-wub for my tastes, but I can’t deny that it runs perfectly underneath splintering doorframes and crackling submachine guns. This is a flashy, interesting world full of seedy drug dens and cartel-owned mansions. It’s definitely not dry, but it may be slightly too distilled. I find myself mildly uncomfortable with a game that celebrates the trappings of the warrior cop. Every bad guy in the game, from cartel enforcers to bank robbers, is designated as a “terrorist” in the map description. Every solution to every problem is swift and lethal. Every upgrade is a bigger gun. While it is technically possible to subdue and arrest criminals with tasers, the game gives no incentive or reward for anything less than obliteration. There’s also no story at all, which simultaneously makes it feel more like a puzzle game and less connected to the consequences of violent law enforcement. There are five campaigns available, with more planned by the dev team, but these are just several thematically connected missions run in sequence. The campaigns raise the stakes for perfectly executing missions, but this is not a game that is interested in telling a story. And in many ways more germane than my squeamishness surrounding current events and aggressive policing, that’s perfectly fine. Door Kickers isn’t interested in politics, and no one is going to demand my gun and my badge at the end of the day. This is a finely, keenly produced expression of a problem (a room full of baddies) and its solution (guns). I find that I’m happy to set aside my reservations and enjoy what is, in every meaningful respect, a puzzle game worth solving. Planned moves are represented by hash lines snaking through levels. Deploy up to eight units at once, depending on the mission. Remember to bring shield units and shotguns for the really squishy jobs. The mission editor is simple and powerful. Here is my latest masterpiece: foggy hedge maze. Soldiers can be renamed after loved ones for maximum sentimentality. Missions plans get insanely complicated, but a flawless operation feels so good. Long-range fights can only be won by assault rifles.